There have been copied Butterfly & Berry large bowls, found in two colors to date: a white opalescent (with a milky look to it) and a dark amethyst. 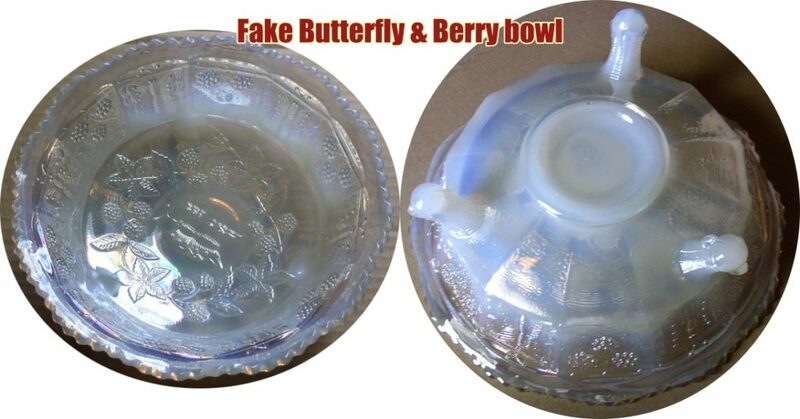 Fenton's old Butterfly & Berry large bowls come in a very scarce white, usually described as ‘frosty' looking (NOT the milky white opalescent) and are also harder to find in Amethyst (and are usually a see-thru amethyst color, not a dark, dark purple). These bowls were imported and sold by A&A Imports.